For about 8 years to date since startup of MI-KUNI, we, MI-KUNI members, have gained a feeling for “vitality and possibility” of “primitive expression” through tackling and working on Japanese ancient performing arts. More clearly, they can be translated into desires aroused by curious tales which we think pure and mysterious, performers’ physical and vocal expressions, or irresistible force of texts which brings a feeling of tension. In other words, we found there what we call “avant-garde of the day”. 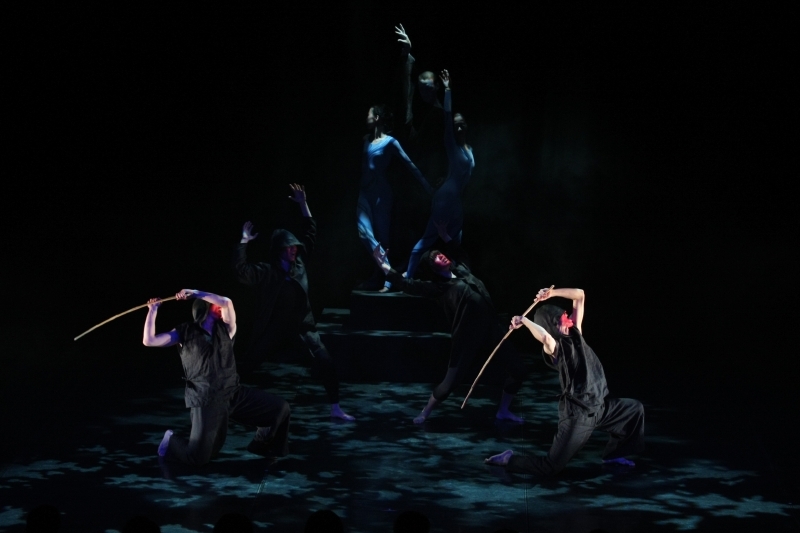 At this stage performance based on a curious work, “Shisha no Sho (Book of the Dead)” written by a Japanese ethnologist, Shinobu Origuchi and traditional Noh music, “Taima”, we try to develop the “feeling” we have ever gained into “confidence”. Shinobu Origuchi who pursued primitiveness in his works, persistently and repeatedly uses many onomatopoetic words in the text. By embodying and enhancing physical feeling and sensual musical senses evoked by such onomatopoeia into pieces of modern dance, we aim to play a part in a new trend of contemporary dance in Japan, in which “tradition” and “avant-garde” are harmonized with each other. And hopefully, we aim to make the audience at home and abroad feel latent power, potentiality and fertility of Japanese culture, that are rarely dealt with by superficial or story-telling “cultural” activities. * Maroudo is a term of ethnology which means a spiritual or divine presence coming from the underworld (the afterlife). Tokyo, is in charge of choreography. She choreographs based on Ballet, by making use of some Japanese dancing styles and techniques she has ever learned including Buto and Nihon Buyo, and aims with Maegawa to create works thoroughly following “MI-KUNI method”, which focuses on not only physicality but also breathing and vocalism closely related to bodily expression. 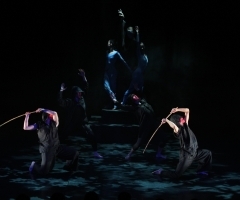 As a base of staging, dancers and actors perform “modern dance” with MI-KUNI’s original musical performance in the background as ever. But the band members are not just accompanists but “performers” deeply engaged in the production. Regarding music, we further develop primitive sounds into which we have put our efforts for past some years by boldly mixing Japanese instruments such as sangen (three-stringed lute) and shakuhachi (five-holed bamboo flute) and percussion instruments of various origins, centering on “utai (songs of Japanese traditional performing arts)”. In the ancient city of Nara, IRATSUME, a young woman of the Fujiwara, a famous aristocrat family, spend her days in copying Buddhist scriptures by hand for making a wish. Then, one evening, after completing the copying of thousand pages, she found a luminous figure floating above Futakami Mountain. She got out of the house and headed for Taima-dera Temple at the foot of Futakami Mountain as if she was led by the figure. It was the spirit of Prince OTSU, who was put to death on a charge of rebellion 50 years ago. At the point of his death, Prince OTSU saw one beautiful woman, MIMI MONO TOJI. The first and the last sight of the woman caused an obsession having his spirit remain in this world. IRATSUME started to weave a Mandala with lotus thread to soothe and calm the wandering spirit of Prince OTSU.